dashboards in order to provide interactive charts. We try to support as many of them as possible. 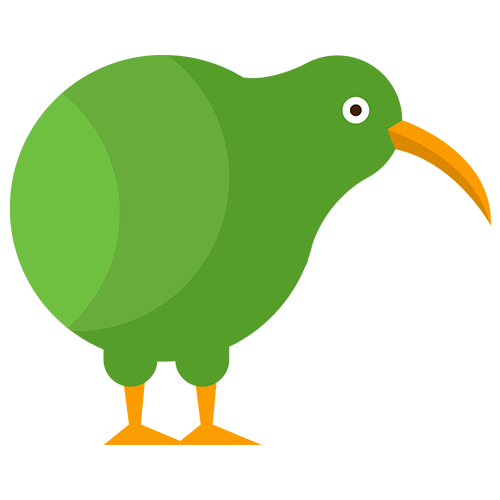 Read on to learn where and how to use filters in Kiwi and its current limitations. Filters are create in an embedded Tableau live screen. 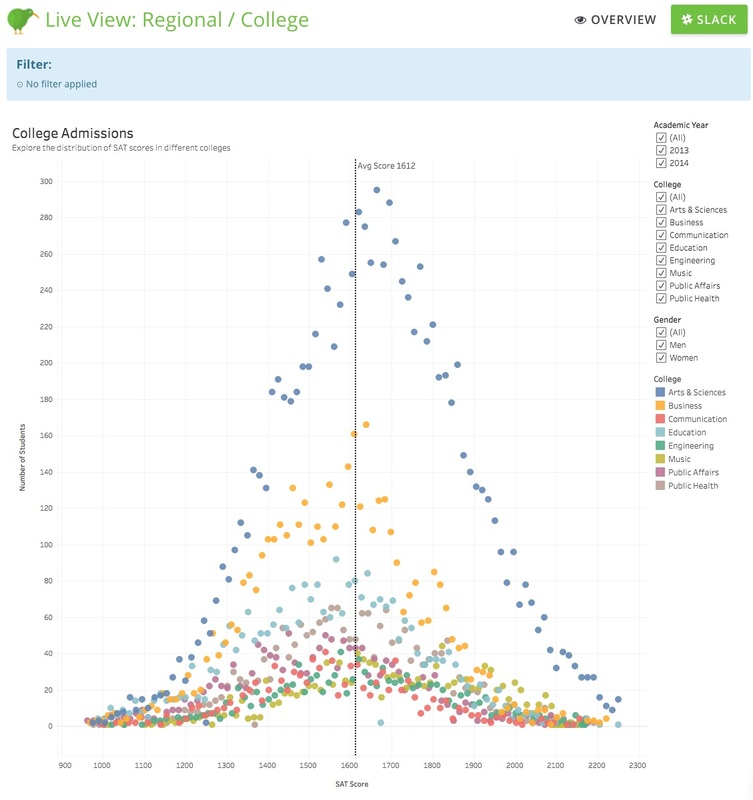 You need to be logged in your Tableau system first. (Your browser stores the login session between Tableau and Kiwi - that is not an security issue!!). 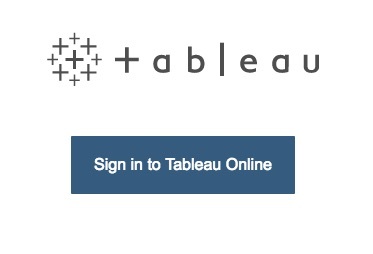 Otherwise you see the following screen and first need to login with your Tableau credential. Depending on the use-case you can then save the current filter with a name, directly send it filtered to a slack channel or use the filter in the scheduled report. 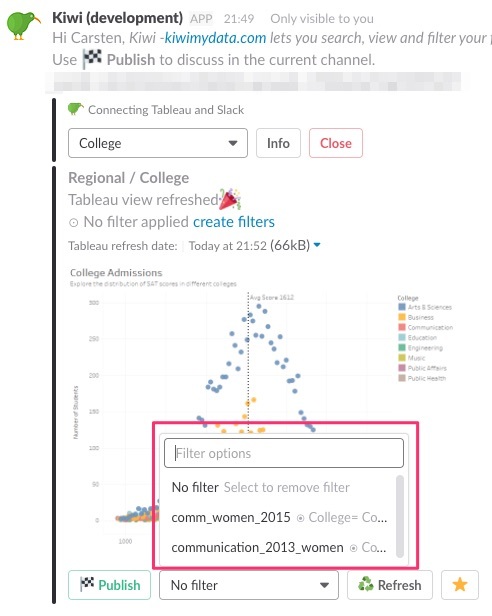 If you save the filter with a name it can be used directly within Slack the next time you request a Tableau view. When you create a Scheduled Report the filter parameter will be displayed as a URL encoded string (as shown below). If you don't know what that is do not worry , it should be fine ;) If you know what it is, feel free to adjust the string just as you like. This string will be used to apply the filter(s) when the Tableau views is requested. Due to technical limitations should be aware of the following, known limitations. Also, you should be aware that we cannot import custom filters directly from Tableau. Filters need to be created within Kiwi so they can be used in Slack BI Self-Services and Scheduled Report Bursting.